John and I headed north to visit his folks last weekend. Central New York is very cold and snowy right now, and the decrease in temperature was sometimes a bit much for my thin Southern-girl blood. Thank goodness for the heated seats in John’s new truck. I liked them so much that there were a couple of occasions when I got out of the truck and couldn’t wait to get back in – such as the evening we stopped at the local ski slope to see what was going on. I took about five steps, announced that it was too cold and got back in the truck. John laughed at me, and justifiably so. There was one place in our travels where I was glad to get out of the truck, cold or no, and that was at Chittenango Falls. I’ve seen the falls before in warmer weather (I’m a sucker for waterfalls, no matter how small) and they’re very pretty. Actually, the falls aren’t really that small – it’s a 167-foot cascade from top to toe, the same height as Niagara Falls. As we headed back home after our visit, I told John I’d like to stop by the falls, just for the heck of it. I was pretty sure they’d be at least partly frozen and worth seeing. You have to drive up a winding road to access the falls, but John’s truck handled the trip easily (the road was clear, which was good). It was a darkish day, with the threat of more snow in the forecast, so I was paying more attention to the road than the view outside. Suddenly John pointed out my window; I looked and boom! there were the falls. Now, this picture doesn’t really do Chittenango Falls justice. It just looks like a bunch of ice and snow (if you click on it, you’ll get a larger image and a much better idea of just how gorgeous it was). We continued driving up the road to the little park at the top of the falls. There was only one other car in the snowy parking lot, and it clearly belonged to a little family that was making its way through the foot or so of snow on the ground near the top of the falls. As we pulled up and parked, the youngest member of the family (a toddler who was manfully trying to make his way through the snow) decided he’d had enough, stopped where he was and had himself a good cry. Mom and Dad gathered him up and headed back to their car as John and I got ourselves zipped and bundled up for our own trek to the water’s edge. 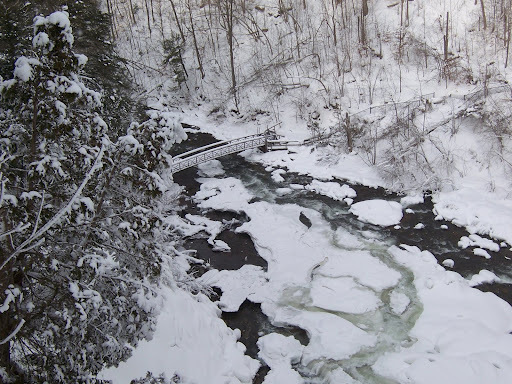 There is a stairway you can take to the base of the falls, leading to a little footbridge that crosses Chittenango Creek, but the stairway was closed due to the snow. We contented ourselves with trudging to the brink and gazing over. The view was breathtaking. 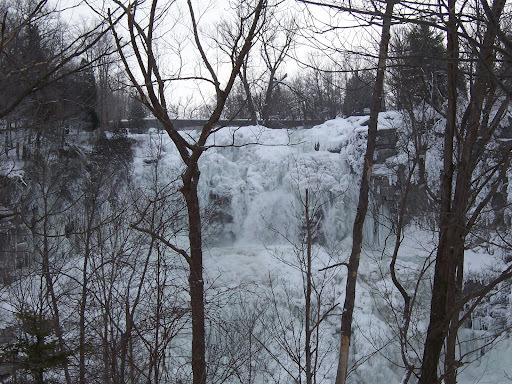 Chittenango Falls was about three-quarters frozen, with a stubborn and very forceful cascade of water churning down the very middle. 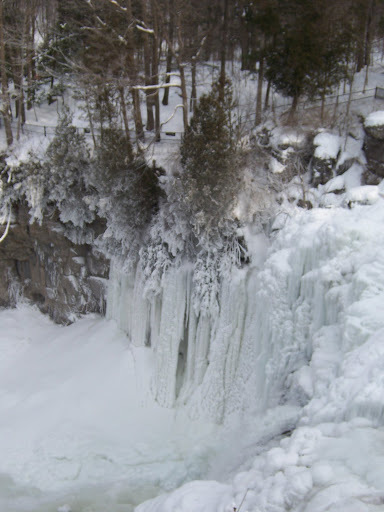 Long icicles hung from the frozen sides of the falls, and the evergreens growing at the edges of the cataract were frosted with ice, which made them look like something you’d find on a fanciful holiday card. Far below, the footbridge arched across the dark water. John and I spent about twenty minutes enjoying the view. Eventually we made our way back to the parking lot, where the little family was headed back to look at the falls, this time with Junior togged out in a snowsuit which made him look like a baby Michelin Man. We wished them a good visit, got into the truck and snapped on those heated seats. 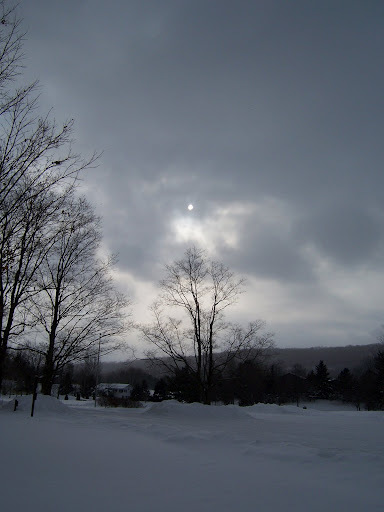 As the warmth returned to our bodies, we headed down into the town of Cazenovia, got a quick bite at Dave’s Diner, and headed south, out of the snow and toward home. Beautiful pictures. Thanks for sharing the magic. Wow. I especially like the picture looking down on the footbridge, but they’re all pretty cool. As it were. The nut doesn’t fall far from the tree, does it? Beautiful pictures and, as ever, so well-written! February 13, 2009 - 8:37 pm Joan L.
The one with the footbridge is now my office computer wallpaper. 🙂 Purty! Absolutely gorgeous pictures, Donna and beautifully written as always.Bit weird hearing your speaking voice in the brief commentary. Not at all what your voice sounds like in my head, it turns out!